My friends and colleagues with young children tell me they are busy sewing or ironing name tags into their children’s jackets, gym shorts, backpacks and the like in preparation for the upcoming return to school. This year, as always, they hope that these things won’t go missing during the academic year (it was often the first week, as I recall). If they were to go missing, parents hope that the items can be easily retrieved from the lost and found box or that someone will return them to their child. Parents hope this; and sometimes it happens. If it doesn’t, usually it’s not that big a deal. Most children’s jackets and gym shorts are pretty inexpensive. Few have sentimental value. Here at the OHS, last year alone, we cared for more than 5,000 lost pets. Sixty one per cent of dogs were reunited with their families but only six and a half per cent of cats. Many of the cats were clearly indoor cats. Very few dogs or cats had any form of identification whatsoever. Had these family members been microchipped, the OHS could have sent them all home—every last beloved pet. Just ask Nadja, who was reunited with her beloved cat Boo here at the OHS last December. Boo (a Siamese!) went missing in late November. Because Boo was microchipped, he was back in Nadja’s arms for Christmas—just hours after he was brought here by a Good Samaritan. Won’t you make the same effort for your pet that you make for your child’s backpack? 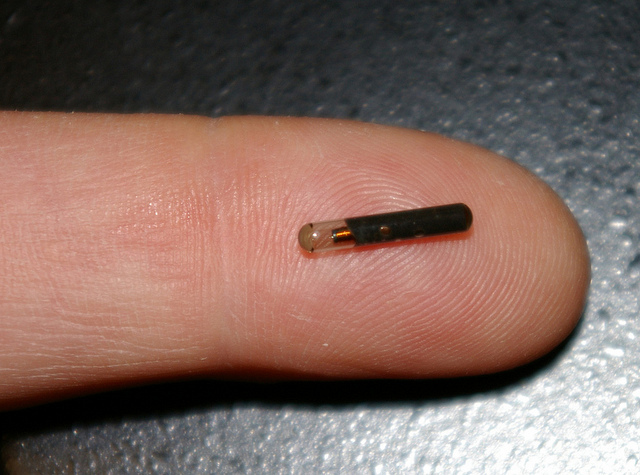 A microchip implant is a permanent ticket home for your best friend.